Recently I noticed the seat on my bicycle that sits in my garden was looking more than a little shabby. With all the colorful yarn that I keep stashed in a basket, I decided to crochet a slip cover. It blends in so nicely that it's hard to tell the flowers from the seat cover. 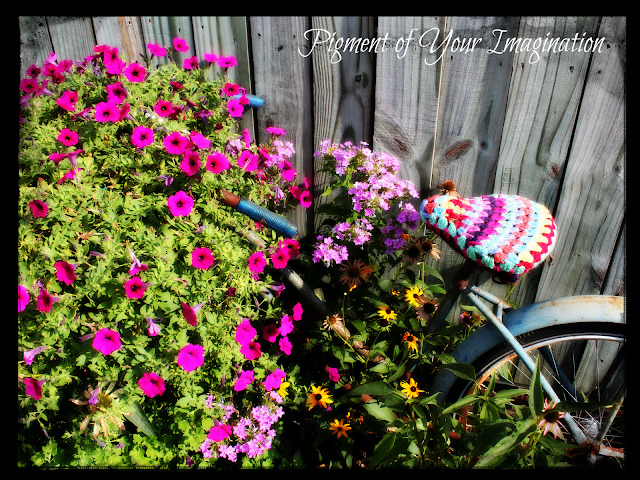 The basket on my bike is full to overflowing with blooms! I used the "bloom" tool on Picmonkey to edit these two photos. Don't you just love the harsh lighting from the bare bulbs! Remember the light fixture episode from an earlier post. We are still looking for a new glass shade replacement. I also plan to spray paint those brass fixtures if I don't have to replace them. I'm taking notes. I bought my kitchen cabinet paint elsewhere and I hate the stuff. So if this is as easy as possible and looks good on completion, I'll be heading to Benjamin Moore. The bike seat is cute as cute can be and I think PicMonkey is pretty cool. Love the glow of your photos. Aren't you the clever one! That crocheted bike seat is just so pretty! I just heard thunder! Please Lord, let it rain. Painting kitchen cupboards has to be the most work, all that emptying, and door knobs and stuff. Bravo for taking on such a task in this heat. I do love your light bulb. Just kidding. Love the crochet seat cover. Aren't you clever, but I already knew that. Don't over do it. Only you.....only you! I love the crocheted seat for the bike! Great inspiration! On the cupcake note however, I havent been painting any, but, I did make some cupcake soaps. Very cute. Dear Catherin! Always like your crochet! Dear do you have idea make a post cards with your cupcakes? It will be great!!!!! I love it! I can't wait to see your kitchen cabinets, I would really love to paint mine, but Gary likes the oak wood as is. I keep trying to convince him, he will brake one day..LOL..
Hi Cathie, love the crochet seat cover for your bike! It's so colorful, and your flowers are beautiful. Good luck painting your kitchen cupboards. It always seems cupboards take so long.